Think back to what it was about wine that made you fall in love with wine itself. Remember all the goose-bumps and tingles that shifted something in you that would never be undone. If you are like me your journey has gone around the world a bit, but I have always kept my feet firmly in Napa Valley and more specifically, with Cabernet Sauvignon. Sure, I have taken barbs from many in the Anti-Flavor group and the usual bunch that eschew anything Napa as well as those who play ‘remember when’ every chance they get and I don’t get hung-up on alcohol levels. I am not in any of those clubs; my club remains open minded and constantly adapting to taste and style trends that my beloved grape takes me. I say all of this because last evening, and a beautiful evening it was, 12 Cabernet aficionados converged on the town that the Dutch colonized in 1624 to eat, drink and just have a good old unpretentious time with our beloved Napa Cabernet. If you are like me, it does not get better than CLONYC 38. I say all of this simply because I can not think of a more exciting time to be a Napa Cabernet lover, (and my memory on such pre-dates many of those here’s birth) and if you really are anything like me, you'll be as giddy. To say Mike Smith makes ‘wine’ is an understatement; Mike Smith lives wine. He is the type of guy that sleeps on the floor alongside his wine barrels just to make sure they have a good nights sleep; he wants to make sure his wines stun their followers. Last night the CLONYC gang met Mike and Leah for round number two of a night that would make even Backhaus jealous. Mike and Leah came full fisted and brought nearly their full 2011 vintage of Napa Cabs, some peek-ins of their 2012s, two fantastic whites and a Pinot that will get your attention. Mike’s mentioned to me early evening his ‘slight’ apprehension to showing these 2011s in public and it proved all to be for naught; they all showed spectacularly well. His 2012s will astound. Any or all would be best bets for your Cabernet dollars. We started with his 2011 whites from Myriad and Quivet. Both delicious, but I was saving my note-taking for my first love, so lets talk Cab. (But not before an amazing Pinot). All wines were opened at 5:30 and single decanted back into its bottle. 2011 Patine Pinot Noir (Gaps Crown Vineyard) Wow! Great aromatics with juicy black and blue fruits. This has tons of verve. I am slowly becoming an aficionado of well made Cali Pinots and this is certainly in the group of some of the best I have had. It’s glossy and pure and just perfect. One to serve for your special guests. 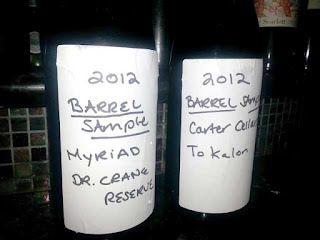 2012 Myriad Dr Crane Reserve Cabernet Sauvignon, barrel sample - yes, you have read it correctly, Dr Crane Reserve. (Please forgive my wows, but there will be many). WOW Dense and packed with cassis, blackberries with the signature creaminess I expect from site. The nose alone is worth the price. I always thought that Dr Crane stood on its own and never needed elevation in title, but this one deserves it. This will be a star of the vintage. You heard it here. 2011 Myriad Cabernet Sauvignon Napa- This wines has quickly become one of my house wines. In 2011 Mike has hit it out of the park and unless this one takes some turn to somewhere else, there will be many smiling faces once people get this one in their glasses. Red and black fruits with some nice aromatics and a liveliness that belies its price point of $50. Grab all you are offered. 2011 Quivet Cabernet Sauvignon Pellet vineyard- A new one for Mike and one he certainly wants to hone in on in the coming years. This has a pretty sweet nose of black raspberries and currants but crosses the palate slightly disjointed and angular. Strangely once food arrived this became much more focused. I would love to see where he goes with this. 2011 Quivet Cabernet Sauvignon Kenefick – if you ever would buy a wine on nose alone, this would be it. Densely packed with dark fruits of black plum, currants and black cherries, this has a wonderful sense of balance and place. Full bodied and pure with some weighty tannins and a finish that haunts. Wow! One of my favorites for two years running now and we haven’t even got to 2012 yet. Daddy’s gonna need a new credit card. 2011 Myriad Three Twins- A bit redder in fruit profile, this comes across with a classiness and elegance that could boggle the mind. 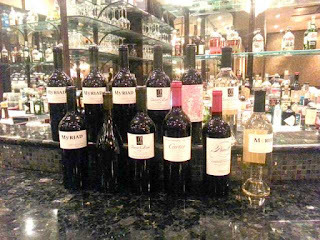 All Mike’s wines (Quivet/Myriad) have a liviliness that makes you sense the family bond. This one had great depth and focus with a super long fruit filled finish. Very nice indeedy. 2011 Myriad Cabernet sauvignon GIII- other than loving this, my notes were a bit sparse. I must learn to STFU and focus focus focus. It garnered a WOTN vote from Mr. Eisenhauer. 2011 Scarlett Cabernet Sauvignon- A new cool label (Client of Mikes) and a very great wine in 2011. Mike must be (and is) very happy with this outcome. A roundness of red and black fruits with purity and elegance. I remember his 2010 last year and this one outshines it leaps and bounds; it has picked up some complexity and focus and stopped being just a Cab. Keep in mind I am liking a 2011 over the 2010 counterpart--- no, replace that with loving. At a price point of about $60, I would recommend this one all day long. 2011 Myriad Cabernet Sauvignon Dr Crane- The Dr. crane bottling is just a half beat behind the Reserve above. It has the cream and lift with a feeling of completeness. Just a great wine all around. 2010 Pruett Cabernet Sauvignon- A new one for Mike. This is reminiscent of the Scarlett above with a bit more tannic grip. Focused and round with many layers of red and black fruits. When you have 14 amazing wines in a row and go with the swallow method over spit, something’s gotta give and had this been in the 1-8 position it would have grabbed lots more attention, but make no mistake, this is fantastic and it garnered a WOTN from Mr. Ormand. I would purchase this on in a heartbeat and I believe the price is within that $60ish range. I could be wrong. All in all I can happily report that this whole line-up ROCKS. Mike has made his passion and attention to detail really work for him (and us!) and for a second year in a row I can easily and unequivocally tell you that he is one of the most exciting winemakers in the valley and unless you live under a rock and have not tasted his wines, I can only ask you why not? I will now clear my inbox for all the thank you emails I will be receiving---but don’t thank me, thank Mike Smith, and whatever you do, don’t ever forget Leah. Thank you for sharing with the group!! I had seen McCartney in concert on Monday and you guys on Tuesday; my week is so full of Rockstars! P.S. It's always fun seeing Mikes brother Doug and his partner Chris too. I just had a small sampling of some left-overs from last night. RE: The 2011 Myriad Napa- If you bought, you did very well indeed. WOW, this explodes from the glass 24 hours later. I believe these are sold out. Look for them next year. RE: The 2011 Quivet Kenefick - This has so much complexity and character. I am buying all offered. RE: The 2011 Scarlett- This is plushy and round with vibrancy. I love the streak of cardamom, soy and sassafras in the middle. Red fruits control the ride, and what a ride it be. This is a sleeper. A very special bottle of wine indeed.